옛말에 ‘같은 값이면 다홍치마 (同價紅裳)’이라는 말이 있습니다. ㈜ 다홍엔터테인먼트라는 이름은 천편일률인 엔터테인먼트 시장에서 신선한 감각과 아이디어를 갖고 있는 회사로 인정받고자 하는 바람, 그리고 나아가 바른 경영과 굳은 신의를 가진 아름다운 회사가 되고 싶은 바람을 담아 지은 이름입니다. 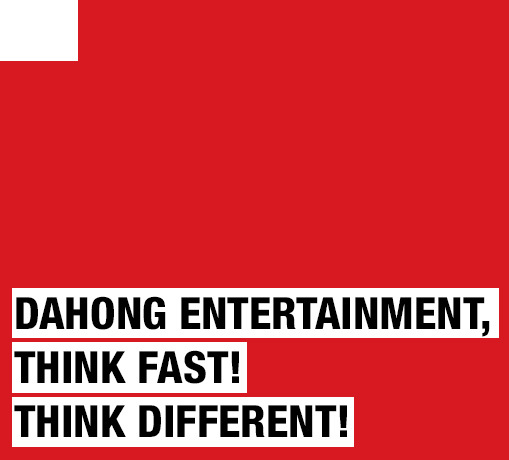 Dahong Entertainment Inc. leads the multimedia business with Dahong's unprecedented insights. Dahong means "scarlet" color in Korean. Its unique connotation of greatness manifests itself in a Korean traditional saying, "Pick a scarlet dress," meaning that all things being equal, one should choose the better option. Keeping the proverbial scarlet dress to its heart, Dahong Entertainment Inc. dedicates itself to become the supreme choice for clients by continuously outperforming the market standard with its originality. Concurrently, Dahong Entertainment Inc. aspires to pioneer the entertainment industry with its clear sense of social responsibility as well as corporate integrity.